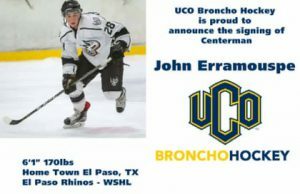 OKLAHOMA CITY, Sept. 29, 2018 – The University of Central Oklahoma, coming off back-to-back-to-back conference championships, has been selected by the Western Collegiate Hockey League coaches as the preseason favorite to win the WCHL in 2018-2019 by a narrow margin. 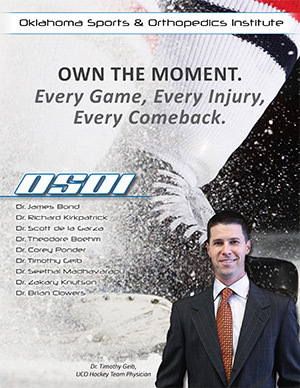 In this season’s WCHL Preseason Coaches’ Poll, Central Oklahoma received 55 of 64 possible points and was selected by five WCHL head coaches to finish in first place. 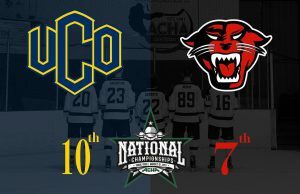 The University of Colorado finished right behind UCO in the WCHL balloting, with 53 points and two first-place votes. The University of Arizona received the remaining first-place vote and finished third in the poll with 48 points. Missouri State University was slotted in the fourth position with 44 points. The University of Oklahoma finished fifth in the poll with 34 points. 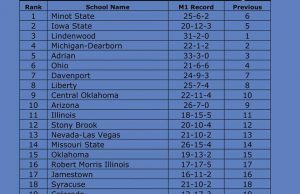 Arizona State University received 24 points to finish sixth in the poll. Colorado State University and the University of Arkansas each received 15 points to round out the poll tied at number seven.